Race is On and Sponsored bySCX!!!!!!!! 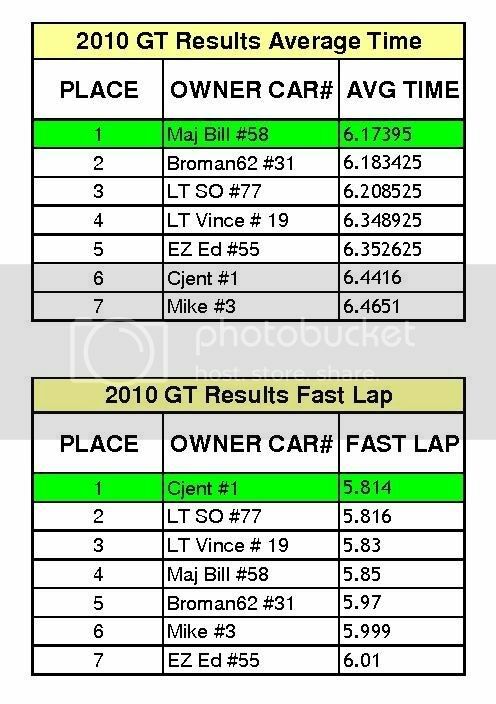 These are the Rules for the 1/43d Scale LMS/ALMS and F1 2009-2010 Road Racing Season. No deviation is allowed. Cars must be Carrera GO!!! F1 or SCX F1, motors are open and General Rules below apply. 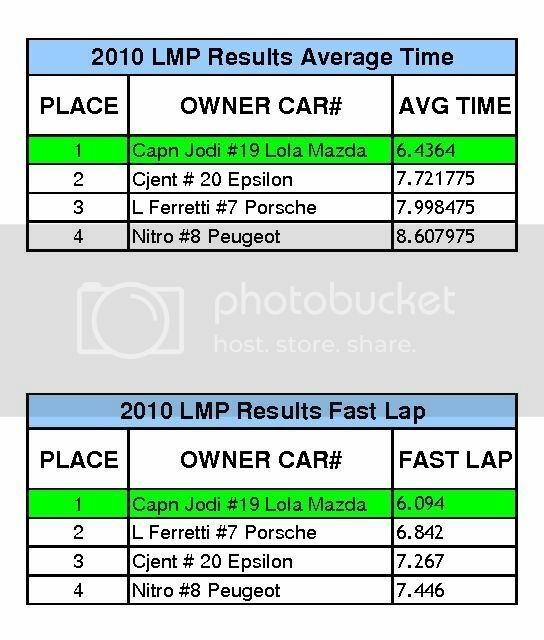 LMP.a) Body must be an open or closed cockpit LMP class car which raced during the years 2006-2009. GT.a) Body must be a two door, closed cockpit car as raced in any GT series during the years 2006-2009, including ACO/LMS, ALMS, FIA GT (1, 2 & 3), Rolex Grand Am (GT Only), Japanese Super GT Series, ADAC GT Masters, GT Open Series, Belgian GT and FFSA GT Series. G.j) Interior must include, at minimum a 1/43d driver on plate or shelf in the proper position for the car. Rear shelf is required under rear window, if car has rear window. No mechanical components can be visible. If vac-formed, must be of reasonable detail and proportion. Paper drivers are not permitted. G.l) Entrant's name, and body screw adjustment information, should be written on underside of chassis in paint or silver Sharpie. The number of magnets you can use will be based on the points assigned to each magnet. More magnets will be added to the list later. Track must be a road course, have dynamic braking and be capable of running at least 14 volts with 3 amps per running lane. Race can be run at 14-16 volt at track managers discretion. Wood tracks must have braid, or equivalent, to allow for magnetic pull equal to plastic track. Tracks must have adequate safety fencing to prevent excessive car damage. Each entry will be $3.50 per car for each race (6) for US, $4.50 for Canada, $6.50 for Euro entries. No more than 1 car entry per class per person (total of 3 cars, i.e. 1 GT, 1 LMP and 1 F1). Sign Up by PM to Cjent! Entry fees will go toward shipping and the remaindr to the Wounded Warrior Project. CJENT1RACING will award $20 to each class winner in cash or merchandise. Race Five: Brandauring June ? Race Six: Torpedo Raceway July ? Last edited by cjent; 07-13-2010, 05:11 AM. Dynamic Breaking, does this mean the track must be wired for breaks through the controllers? Brakes through contollers, Barfly, is correct. The Sanctioning Body, Team HPRA, will require picture proof of wiring from track owners. Magnabraid does not give the magnetic effect of plastic track. Heck, even if you add magnetic paint to the magnabraid it still doesn't have the same magnetic effect. Even if you add magnetic filings to the magnetic paint, it still lacks the same pull as plastic. But then again do all brands of 1/43 track provide the same amount of magnetic down force? Last edited by DrDiff; 10-15-2009, 05:51 PM. True Doc. And the cars will be equal, so close enough. PM or email me for body availability. Last edited by cjent; 10-18-2009, 02:22 PM. Barfly Racing is definitely in ! easily to a SCX Compact Tuner chassis. From what I can tell , that looks really good! Just kidding Joe, and thanks for the donation of one for a prize. Are you running that one? That body is terrifc. I got 2 more for HPRA members. They can't wait to build them. Thanks all entrants for a great Round 1. 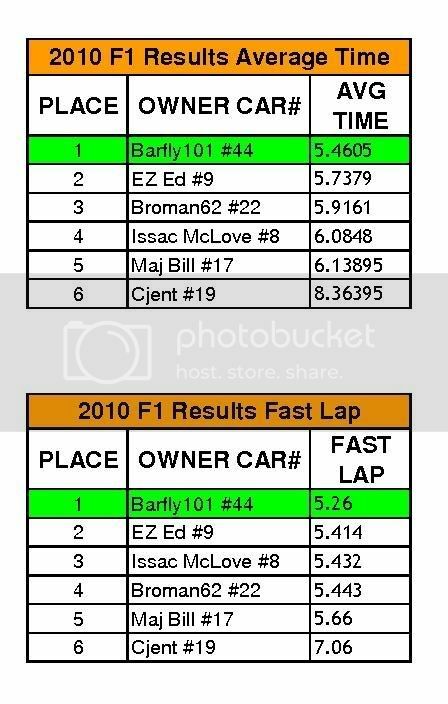 Results for Race 2 - Thanks Micyou! I would think about terminating his/her contract.